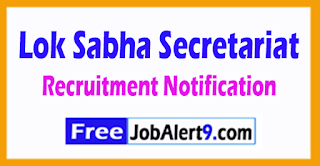 Lok Sabha Secretariat Issued a Advertisement For Recruiting 31 Translator .All Eligible And Willing Candidates Can Check Detailed Advertisement From Their Official Website And Apply Offline / Before 14-08-2017.Eligible &Interested Candidates Can Check Detailed Information For Each Postion Such As - Eligibility Criteria, Qualifications, Age Limit, Selection Procedure Before Applying. Salary And Grade Pay Scale:INR Rs. 9300 - 34800/- With 4800 /- Grade Pay. Candidates Must Pass Diploma, Certificate course in Translation from Hindi to English, Master Degree or its Equivalent Qualification From A Recognized Board / University. Candidates Can Download Application Form through official website (http://www.loksabha.nic.in). After Filling The Application form, Candidate must send hard by copies of Application along with relevant testimonials Mentioned In Detailed Advertisement to the following Address Before (14-08-2017). Important Dates : Last Date for Receiving of Offline Application Form Is: 14-08-2017 . 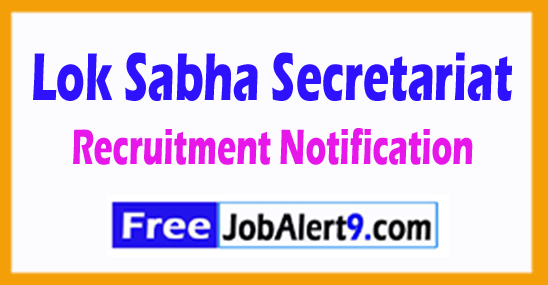 Lok Sabha Secretariat Issued a Advertisement For Recruiting 31 Junior Clerk.All Eligible And Willing Candidates Can Check Detailed Advertisement From Their Official Website And Apply Online / Before 09-08-2017.Eligible &Interested Candidates Can Check Detailed Information For Each Postion Such As - Eligibility Criteria, Qualifications, Age Limit, Selection Procedure Before Applying. Candidates Must Pass Graduation Degree Any Discipline or its Equivalent Qualification from A Recognized Board / University. Candidates May fill the online Application through official website (http://www.loksabha.nic.in). Before /(09-08-2017).